LEAPING over four people for a jam, throwing down tomahawks over superstars including once against LeBron James, and zooming past PBA greats, his own father Benjie Paras included, on his way to more slams. Above the rim play is a given once Kobe Paras steps on the floor. But since the lanky winger left the country to train and develop his skills in the US a few years ago, much has changed for him. 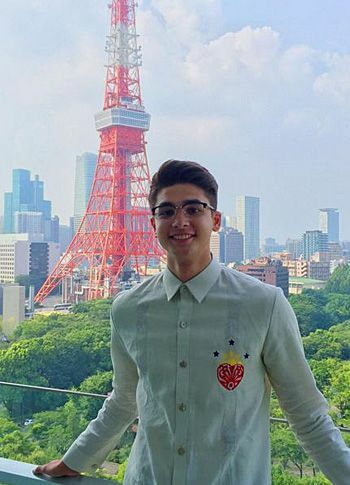 Kobe Paras is no longer just the high-flyer with a limited arsenal of moves and a limitless potential to improve. In fact, he is on the way to suiting up in Division I of the US NCAA, one step closer to the grand stage that is the NBA. It could take a while before he could find his feet in the Pac-12 with the UCLA Bruins, but the marked improvements in his game on the floor and his significant impact off the court are undeniable, especially last year when the young Paras took his place among some of the biggest names in Philippines basketball as the country made a bid for the hosting of the Fiba World Cup. While his role was limited and the bid unsuccessful, it remains impressive that the towering lad was cast among sports luminaries headed by Manny Pacquiao in Tokyo as the Philippines challenged sports giant China, which brought in its own heavy hitters led by Yao Ming. At 18 years old, with elite level of play still years away, Paras is making an impact early, on and off the hardcourt — serving as a huge inspiration to the youth while already emerging as challenger to the current stars. Last year, Paras made a good impression in both competition and training in New York with the top 100 high school prospects in the US. And if that’s not impressive enough, Paras showed flashes of brilliance in exhibition games against some of the biggest local and international stars, including four-time NBA MVP James. “He is the future,” former Gilas Pilipinas playmaker LA Tenorio said, echoing the thoughts of many Pinoy basketball fans. And the hype only grew even louder with news of a scouting report that described Paras as potentially an NBA prospect. But the young high-leaper knows how to keep things in proper perspective and have his feet firmly on the ground, thanks to the guidance of his father. Still the only Rookie-MVP in the PBA, Benjie has managed to keep Kobe from being overwhelmed by all the fuzz and attention. A thorough reading of the scouting report would show it was not all that flattering, but the wiry 6-foot-7 winger is just focused and eager to improve his game while adding to a resume that already includes stints with Batang Gilas in the Fiba Asia Under-18 and back-to-back victories in the Fiba 3x3 World Under-18 slam dunk contest. Kobe has vowed to work on becoming a complete player as he prepares to suit up for the UCLA Bruins after a fine high school stint with LA Cathedral. “I want to develop everything in my game,” said Paras. Several times he has worn the tri-colors in international duty with youth teams, and Paras is even more determined to gain his first full cap, refreshing to hear at a time when the most talented players struggle to choose between club and country.